His Holiness's life has revolved around the church since his youth. He wished to live the life of monasticism so he entered the Monastery of St. Pishoy in Wadi Elnatroun on August 20, 1986 and remained a brother for two years. He was ordained a monk on July 31, 1988 and after a year he was ordained a priest on December 23, 1989. Two months after, H.H. 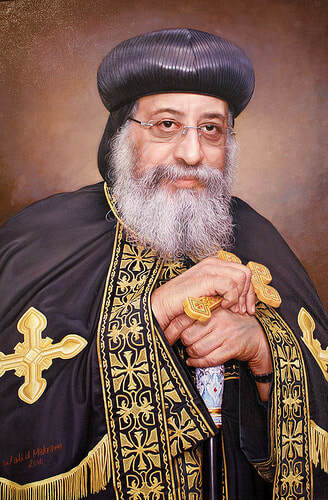 Pope Tawadros started serving with H.E. Metropolitan Pakhomious of Beheira on February 15, 1990. He was ordained a bishop on June 15, 1997 by H.H. the Late Pope Shenouda III as a General Bishop assisting H.E. Metropolitan Pakhomious. His Holiness focused on childhood whether it was in the country-wide children's festival as well when he was in charge of the children's committee in the Holy Synod. Before assuming the papacy, H.H. wrote twelve books.